The hippies at People for the Ethical Treatment of Animals have angered the NAACP with their new campaign comparing mistreatment of animals to mistreatments of black people. PETA's campaign "included 12 panels juxtaposing pictures of blacks in chains with shackled elephants and other images." I addressed another hippie rant last week, but I think it's important to point out just how dangerous PETA's campaign is. Despite a PETA official's claim that "a rat is a pig is a dog is a boy", everyone instinctively knows that human beings are above the animal kingdom. Because God has placed the animal kingdom below humanity, it is not possible to raise animals to the level of humans. It is possible, however, to lower human beings to the level of an animal. All human beings (save for those so educated that they can't think) instinctively know that it is not only morally permissible, but that killing animals is often a moral obligation. We kill scores of rats and mice when they get into our homes and businesses in order to protect human health. Rats and mice, because of the disease they bring, are pests to be eradicated. Adolf Hitler compared Jews to rats over and over, demeaning them and hardening the German people's hearts for the Holocaust that would come. When some hippie from PETA says that "a rat is a pig is a dog is a boy", he is using the same rhetorical tactics that Hitler used. But far from elevating animals, PETA is devaluing human life and placing it below the animal kingdom. We see PETA's contempt for humanity in the words of Ingrid Newkirk, who said "Even if animal research resulted in a cure for AIDS, we'd be against it." Newkirk believes humans, unlike the rest of nature, do not have the moral standing to use other species for our benefit. Hitler's rhetoric is a historical example of how lowering the value of human life to that of an animal paves the way for things like the Holocaust. I will say, then, that I am not, nor have ever been, in favor of bringing about in anyway the social and political equality of the white and black races -- that I am not, nor have ever been, in favor of making voters or jurors of negroes, nor of qualifying them to hold office, nor to intermarry with white people; and I will say in addition to this that there is a physical difference between the white and black races... I, as much as any other man, am in favor of having the superior position assigned to the white race. By putting pictures of mistreated or murdered blacks next to pictures of animals, PETA reinforces the racist rhetoric that compared blacks to apes and monkeys. I'm sure the Ku Klux Klan and the World Church of the Creator is applauding PETA's campaign. In fairness to PETA, I do not think that they are racists and I do not believe that the campaign was intended to demean black people. Like their whining about how animals are harmed by military conflicts in the Middle East while ignoring human suffering, the "Animal Liberation" campaign is an example of the disrespect PETA has for all human life, not just the dark-skinned. Regardless of the intent, though, the message sent is a racist one. 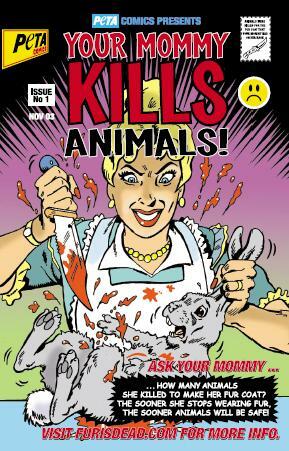 I think it is telling, though, that PETA chose "Animal Liberation" as the name for this campaign. The Animal Liberation Front has used bombings and arson across the country in the name of "animal rights". Did PETA choose that name to express support for terrorists? For those who want to advance the cause of animal welfare, PETA's radical tactics are counterproductive. PETA can easily make progress with not only Leftists, but with moderates and conservatives were they to pursue more moderate goals. For example, do we really need to kill animals for fur, when attractive and real-looking fake alternatives are available? Yet people ignore the (rare) reasonable things PETA has to say about fur, puppy mills and other issues because of their extremist rhetoric. Both the cause of animal welfare and animal "rights" would be greatly helped if PETA were to be disbanded and replaced with a more serious organization.